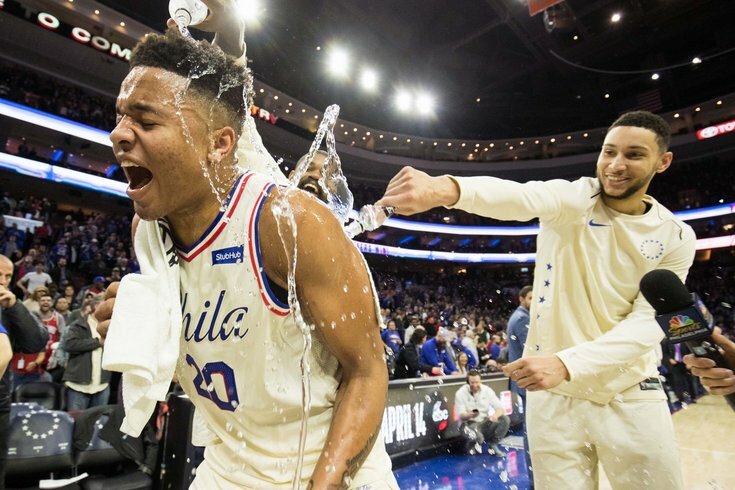 Philadelphia 76ers guard Markelle Fultz is doused with water by guard Ben Simmons and center Amir Johnson after recording his first triple double in a game against the Milwaukee Bucks at Wells Fargo Center. Markelle Fultz's rookie season with the Sixers was a true saga, unlike any NBA fans have seen in the history of the league. From No. 1 overall pick – after a trade between Philly and Boston – to an impressive summer league showing, to a perplexing injury and deformed jump shot, to a triple-double in the middle of a 17-game winning streak and everything in between, the only thing anyone knows for sure about Fultz is there is no telling what he'll become. The range of outcomes, from bust and flame-out to a superstar on a Championship team, is wide-reaching for Fultz. But perhaps some of the Sixers' own history will work in his favor. Joel Embiid, who made the All-Star Game in 2018 and will likely be a member of an All-NBA squad, sat out two seasons before nearly winning Rookie of the Year. Ben Simmons sat out last season as well, but burst onto the scene with 13 triple-doubles and is likely to beat out Utah's Donovan Mitchell for Rookie of the Year. Both Embiid and Simmons sat and learned how to be NBA players. Each took mental reps on the sidelines and built chemistry despite not being able to step on the floor. In 2017-18, Embiid and Simmons played like seasoned veterans. Fultz only suited up 14 times this season, and while he definitely showed he has some skills, he also definitely still some things to work on. His extended time on the sideline could have been a frustration. Instead, it was a teacher and a motivator. "I'm just looking to prove that I belong to be here," Fultz said in an exit interview at the Sixers' training facility in Camden Thursday. "I want to show I am an NBA player and show why I am here." Fultz did not hit the floor in the five-game series loss to the Celtics, with head coach Brett Brown instead electing to play T.J. McConnell, first as Simmons' back up and later as a starting guard. Still, Fultz sat there, cheering and soaking up everything like a sponge. "Even being able to practice with these guys, learn from them while I was sitting out, I was able to see things from a different perspective," Fultz said. "Seeing who was open when we ran plays, seeing the defensive spots that you needed to be in, it helped me a lot. I am very happy with what I've learned over this period of time." The pressure this offseason will be quite high for Fultz, who sat on the bench as the pick he was traded for — Boston's Jason Tatum (No. 3 overall) — averaged 18.8 points over more than 35 minutes per game in the playoffs so far. RELATED: What was really going on with Markelle Fultz? There won't be much patience for Fultz next season. It's time for the growing pains to be left behind. He has to show he was worth the trade and worth the pick. "Obviously I had injuries," the rookie added. "I had stuff I had to work through. I think I dealt with it fine. ... I am not all the way there I have a lot more work to do, and the grind starts now." Adding some muscle is on his list of summer goals, but fixing his jump shot is probably the top priority. Fultz says his range is getting close to where he wants it to be but it isn't quite yet. The Sixers are turning themselves into a well-oiled machine, with Embiid, Simmons, Dario Saric and Robert Covington all returning next year, likely to the starting line up, ready to accept Fultz into the fold (that is, if they don't sign LeBron James or Paul George). "Coming back next year, once I join that [lineup], we can take it to the next step," Fultz said.